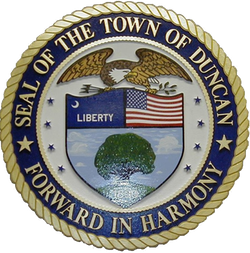 Like many municipalities in South Carolina the Town of Duncan, SC uses what might best be described as a traveling Judge. Judge Vicki Rae Smith travels to the court house in Duncan twice a month. Court is held on the first and second Thursdays of each month. The court house and the Town Council meet in the same chambers. This is directly behind the Duncan Town Hall just a short walk down Hughes Street. For more information on court proceedings please contact our Town Clerk Melody Millwood who also doubles as clerk of court on the days court is in session. She can be reached at (864) 249-8013. You can pay traffic tickets online. To do this you can click on the link below. Clicking on this link will take you to a different web site. You should see something similar to the picture shown below when you click on the link. You can also visit the Duncan police behind Town Hall to pay tickets in person.